The 2016 (Brand New) AHA BLS for Healthcare Providers course is the premier CPR class for medical and nursing students and medical/dental professionals. This AHA BLS for HCP course (released 2/28/2016) is a two-year certification course, and is universally accepted for health-related occupations and schools. Our course also provides the latest 2015 ECC protocols for care. This course teaches recognition of several life-threatening emergencies, provides CPR practice and skill test, use an AED, and how to relieve choking in a safe, timely, and effective manner. Similarly, use of bag-valve-mask (BVM) and 2-rescuer CPR is taught, practiced and skills tested. AS an official American Heart Association Training Site, we provide “end-of-your-class” BLS certification cards! Note: Although the AHA BLS course is targeted for medical professionals, many lay responders, factory workers, moms, etc. have taken and completed this course. 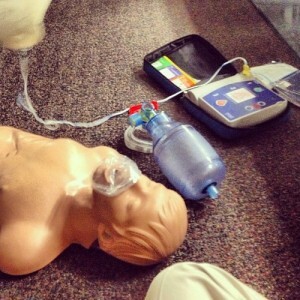 Likewise, if a lay responder can learn 2-rescuer CPR and how to squeeze a bag-valve mask, they can pass this course. AHA Basic Life Support for Healthcare Providers teaches all of the CPR and AED information in a Heartsaver (lay responder) class. Skills Practice & skills check: 35 min. – 45 min. Cost per skills check: $45 for special appointment, $30 prior to any scheduled Newnan CPR class. 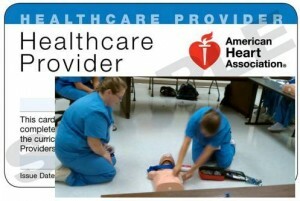 Certification: 2-year AHA BLS Provider card. (This is the official, approved, American Heart Assn. BLS for Healthcare course, approved in every state – the gold standard for BLS for medical profesionals and students). You get the exact same card you would receive if you sat in a 3 1/2 hour AHA BLS Provider class. Q. Do I need a book or should I buy an AHA book for AHA BLS class? A. We will have available a current AHA BLS course book, called a “Loaner book”, for your use during your BLS class. If you want to buy a book, it’s $17 for a BLS book. Anyone can buy a book ahead of class ($13.25-13.95 plus shipping) from Laerdal, Channing-Bete, or WorldPoint, the 3 authorized distributors of AHA course materials. (Finally, you can also purchase an “AHA eBook” from AHA ($13.25 for BLS eBook), site is https://ebooks.heart.org/ . Q. Are there other options for completing the AHA BLS for HCP course, other than 3-hour class? A. Yes, blended training. As shown above, you can take the AHA online HeartCode BLS Part 1, at your convenience and leisure, from onlineAHA.org, it’s $28.50 for AHA HeartCode BLS. Within 60 days of completing Part 1, get a BLS Skills Session, we charge $30 if before one of our scheduled classes, or $45 if we meet you just to do a BLS skill check. It takes about 20-40 min for skills practice (Part 2) and 10-15 min. for BLS skills check (Part 3). Q. Is the AHA BLS for HCP course fee firm? A. All course fees are determined by the AHA authorized provider and instructor, but have to cover equipment, cost of the facility, instructor time, and CPR supplies. If you have a conference room and training room and at least 6 people to take a class, we can certainly teach for $5-10 less per student. AHA Disclosure: “Use of AHA materials in an educational course does not represent course sponsorship by the American Heart Association. Any fees charged for such a course, except for a portion of fees needed for AHA course materials, do not represent income to the Association”.